Feast Island’s One Year Anniversary! That’s right: TODAY is the one-year anniversary of my book’s publication! I cannot believe how quickly time has passed! 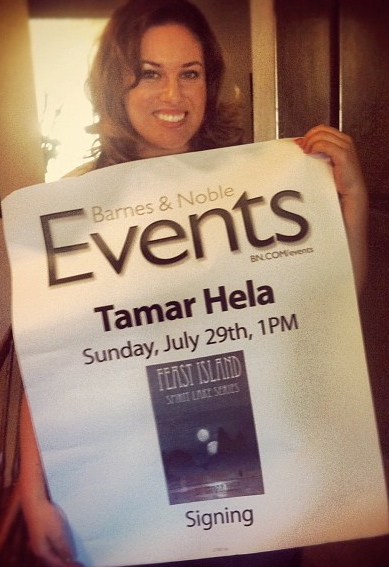 It’s already been a whole year since Feast Island was born into the literary world. Through this journey, I have met amazing people–both on and off-line. I have had the opportunity to speak to people of all ages, have signed hundreds of paperbacks, bookmarks, and other pieces of paper. I’ve spoken to aspiring writers and supportive fans…I’ve had some parties, and even went on a book tour back East. Just as it takes a village to raise a child, it takes a village to raise a book. To those who have been with me along the way–you know who you are and I thank you from the bottom of my heart for all the love, encouragement, and support you’ve given. Besides the next installment of the series? How about a second edition of Feast Island?! Yes, that’s right: I will be releasing a new and improved, second edition of Feast Island. There will be a new cover, a map of Cantelia, some character drawings, and maybe even some new scenes! Stay tuned for the release date. Until then, get your hands on a FREE eBook copy of Feast Island. Click HERE to get it on Amazon. Thanks so much to those of you who read my blog–and especially those who are reading this post. I can’t wait to write even more. Writing has become my drug of choice and I look forward to every blog post, short story, novel, heck–even Tweet–that I get to write! Hope you’ll all be around for many, many more years to come. Thanks for reading and hanging! Cheers!